This free, printable business plan outlines key strategies and market development for starting up a truck and freight company and competing against other shipping businesses in the market. COMPANY NAME is a well established trucking and freight company. The company is engaged in the services of delivering cargo for many of the manufacturers in [CITY], [STATE], providing wood products, aluminum, fabricated building, and fencing products to locations across the country. The company is dedicated to providing the highest quality services, meeting the required delivery dates and executing the pickup and delivery of the cargo in accordance with the client's needs. The focus of this business plan is to identify its future target clients, explain its marketing strategy and to improve its internal procedures so it can substantially increase profitability. 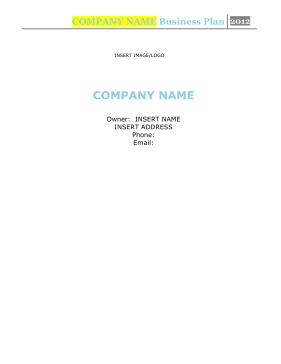 COMPANY NAME is located in [CITY], [STATE]. The company is a family owned and operated business, founded by INSERT NAME, in October of 1983; they started with one delivery truck. COMPANY NAME has expanded their services and fleet of trucks and now has long term delivery contracts with many of the major manufacturers in the area. COMPANY NAME has become a well-known icon in [CITY] and is known for the premium services and competitive prices they provide to their clients. COMPANY NAME provides delivery services many of their larger competitors are unable to provide. They work with a schedule that is at a 90% to 95% capacity, most deliveries are scheduled two weeks in advance. The company has drivers on call for rush deliveries, full load cargo (L) and Less than full load cargo (LTL) and will deliver anywhere the client needs them to go. There are approximately 126 manufacturing plants in the town of [CITY], many of whom are current clients of COMPANY NAME. By expanding their services and fleet of trucks, they will be able to offer delivery services for the other manufacturers. The marketing research and tailored marketing strategy projections described in this business plan, will increase COMPANY NAME profits over the next three years, this is only an estimate, and depends on how well the economy recovers over the next two to three years. Furthermore, with the ability to generate so much cash flow, it is assumed that the company will seek to use this asset to expand its markets and delivery capacity in the near future. • Obtain new accounts before the end of 2010. The mission of COMPANY NAME is to remain a leading freight and trucking operation, servicing the major manufacturing companies in [CITY], [STATE] area. • COMPANY NAME offers quality, cost effective freight services. • The goal of COMPANY NAME is to hire 5 additional employees as they expand their business services. • COMPANY NAME will continue to provide reliable, secure, on time services; with an ongoing comprehensive quality control program providing 100% customer satisfaction. • Maintain beneficial long-term relationships with our clients. This will increase profits through referrals and repeat business.